How Good Can Nathan Eovaldi Be? When the Yankees traded David Phelps and Martin Prado to the Marlins For Nathan Eovaldi and Garrett Jones, it was clear that the 25-year-old Eovaldi was the main target Brian Cashman was looking to acquire. In Eovaldi, the Yankees saw a young, durable pitcher with a huge arm and untapped potential. So far this spring, Eovaldi has made everyone look like geniuses. Have the Yankees finally figured out the key to unlocking Eovaldi’s fullest potential, and can he be a breakout star for them this season? I think so, and I’ll tell you all why right now. First of all, Eovaldi didn’t come to the Yankees on a biscuit train with gravy wheels and ready to dominate the American League. Last season, he had a 6-14 record on the Marlins, and his 4.37 ERA and a league-leading 223 hits allowed didn’t exactly bring back memories of fellow Alvin, Texas native Nolan Ryan. However, there was plenty that Eovaldi did well in 2014, like his 43 walks (1.9 per nine innings), 3.37 FIP and only 14 home runs allowed. His FIP, as well as a .323 BABIP (.286 in 2013) and 65% LOB percentage (73% in 2013), suggest that he might have fallen victim to some bad luck that inflated his numbers and drove up his loss total. His bad season certainly can’t be all blamed on bad luck, but there’s no getting around the fact that some bad luck was involved. In my opinion, the main thing that has held Eovaldi back throughout his career is a very low 6.3 K/9 average. He does a good job of keeping all of his pitches down, but that’s a lot less Ks than you would expect from a guy who can hit 100 mph on the gun. That’s not so good. The Yankees most definitely had all of that in mind when they acquired Eovaldi. They believe that pitching coach Larry Rothschild, who has a reputation for pulling strikeouts out of pitchers, can teach Eovaldi to be a better pitcher, instead of just a kid with the mean high-90s fastball. Eovaldi certainly has plenty for Rothschild to work with. According to Brooks Baseball, Eovaldi’s fastball averaged 96.7 on the gun last season and topped out at 101.08. Yep, that’s one mile per hour for every dalmatian puppy Cruella De Vil wanted for her fur coats. His main secondary pitches have been a slider that averaged 87.18 mph and a curveball that sat at 76.8 mph, neither of which really did much to intimidate batters last season (especially lefties). If your secondary pitches aren’t making hitters bite, they’re just going to sit on your fastball. Unless you’re throwing 107 mph like Steve Nebraska in “The Scout”, major league hitters will eventually be able to time your fastball, and they’re gonna hit it hard. That’s probably a big reason Eovaldi led the National League in hits allowed last year. So how can the Yankees better Eovaldi? The key to furthering Eovaldi’s development and pulling that ace out of him might just be a pitch that he developed late last season, when he started fooling around with a splitter. Eovaldi had struggled with a changeup for years. Last September, Marlins’ pitching coach Chuck Hernandez suggested that Nathan use a split-fingered grip instead. Over his last two starts, Eovaldi, while he wasn’t a different pitcher or anything, performed quite admirably, allowing only four earned runs over his final 13.2 innings. What Rothschild and the brain trust on Girardi’s staff are hoping to do is to take the confidence that Eovaldi already has in the splitter and turn that into a legitimate third strikeout pitch, behind the heater and the slider, which will help him keep hitters more off-balance, up his strikeouts per nine and keep hitters from being comfortable enough to make such good contact against him. So far this spring, Eovaldi has looked awesome. I know you can’t put too much stock in spring training numbers, but through 13.2 innings so far, the righty has allowed just one run, no walks and struck out 14. That’s 9.2 Ks/9, almost three more than his career average. Just to put it into perspective a bit, even in his other spring trainings, Eovaldi hasn’t pitched quite like this. In 2012 with the Dodgers, he had a 3.60 ERA and only 11 Ks in 20 innings with the Dodgers. In 2013 with the Marlins, he had a 3.66 ERA with 16 strikeouts in 24.2 innings (5.8K/9). Last year in Marlins camp, his numbers were better (3.44 ERA and 18 strikeouts in 18.1 innings), but that’s still not quite near his numbers so far in Yankees camp. We’ve seen him touch the high 90s with his heater already, which is a great sign in March. 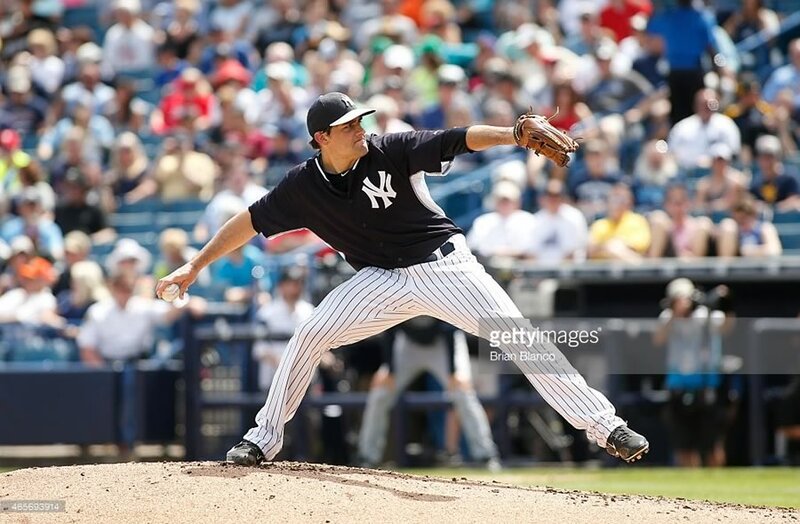 The buzz around camp has many believing that Eovaldi’s ready to unleash a great season onto the American League East. Pretty impressive, right? Frankly, I think everyone needs to hope that Eovaldi does have a breakout year. Although the Yankees rotation is healthy now, there are still a lot of quesiton marks. Is Masahiro Tanaka‘s elbow OK, and will it hold up for a whole season? Pedro Martinez seems to think not on both counts. Can Sabathia be a dependable, solid big league starter? He has some velocity back, but the results so far this spring have been less than encouraging. Can Pineda stay off the DL? He’s another guy that has looked ready to destroy the league so far this spring, but he needs to prove he’s not made of tissue paper like he was last season. Finally, the current fifth starter is Adam Warren, who has three big league starts under his belt, but has never been an official member of a big league rotation. There’s a chance everything could come together to give the Yankees a solid rotation, especially if Ivan Nova can regain his form after Tommy John surgery, but there’s also plenty there for everyone to have doubts about. If Eovaldi can finally, as he enters his prime years, tap into all that potential and become the next Garrett Richards, that would make me, and everyone else in Yankees land, feel all the better about 2015 and beyond. Eovaldi will make his final start of the spring in the Yankees final spring training game on Saturday. He’s earned himself the fourth spot in this rotation (as if there was ever any doubt), so he just needs to go out there and keep doing what he’s been doing. If everything goes according to plan, he’ll make his Yankees debut at home against the Red Sox on April 10th, which is really a perfect Bronx baptism for a new pitcher. We should get a pretty good idea of what he’s gonna bring to the table if he can get perform well in that situation. I think he’ll do just fine that day, as well as the rest of 2015, which is why I drafted him with my last pick in my fantasy baseball draft a couple of weeks ago. Let’s go Nathan. I just want to tell you good luck. We’re all counting on you. What do you think, Pinstripers? Do the Yankees have a potential ace up their sleeves?